FORMER Nissan chairman Carlos Ghosn today accused executives at the Japanese car giant of a ‘conspiracy’ that led to his arrest on financial misconduct allegations. 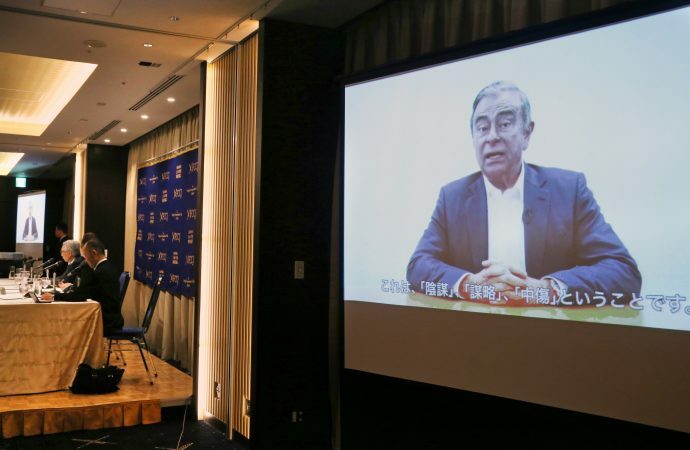 Ghosn spoke calmly as he maintained his innocence in a 10-minute video released by his legal team at the Foreign Correspondents’ Club in Tokyo. His lawyer, Junichiro Hironaka, said the video was prepared in case Ghosn wasn’t able to speak at a news conference. Ghosn was rearrested last week while on bail. The 65-year-old former boss of the manufacturer said the executives behind the conspiracy were motivated by what he called ‘selfish fears’ and had mistaken his leadership for greed and dictatorship. Nissan has said he initiated financial misconduct it later uncovered and used the company’s money for personal gain. Ghosn said the executives behind the conspiracy were concerned about what they saw as a merger with French alliance partner Renault SA, adding that he had been the biggest defender of Nissan’s autonomy. Hironaka said a section of the video in which Ghosn named names was removed on his advice. Ghosn’s fourth arrest was on a fresh breach-of-trust allegation based on suspicions that payments from a Nissan subsidiary to an Oman dealership were diverted to a company effectively run by Ghosn. Yesterday, as reported by Car Dealer Magazine, Nissan shareholders voted to oust Ghosn from the board and to approve the appointment of French alliance partner Renault SA’s chairman Jean-Dominique Senard as his replacement. Renault owns 43 per cent of of the company, which makes the Leaf electric car, March subcompact and Infiniti luxury models, and was on the brink of bankruptcy when Renault sent him in to turn it around two decades ago. ‘I love Japan and I love Nissan,’ he said in his video, adding the company had achieved much under his leadership. He appeared to be saying he was the best leader for Nissan, while those behind the alleged conspiracy were failing. ‘It’s sad. For someone like me, it’s sickening,’ he said. Hironaka said he would appeal against Ghosn’s latest arrest and detention. Multiple arrests and prolonged detentions are routine in Japan’s criminal justice system, but an arrest after someone is released on bail is unusual. Prosecutors say the latest allegation is different and there is a risk Ghosn may tamper with evidence. His defence team says the allegations are related, and authorities have already seized all the documents.